The biggest hit in the art and photo market in recent years has been the gallery wrap. Hard-edged, impactful and undeniably stylish, gallery wraps make the perfect statement in the contemporary home, office and gallery. The graphics and display industry is always looking for stylish, innovative and low-cost solutions. 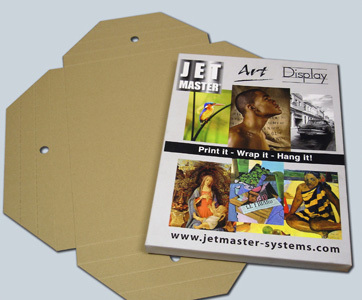 With Innova Art’s JetMaster system, tough, lightweight 3-dimensional box frames can be turned out in minutes. It’s the simple, cost effective way to make images really stand out. The JetMaster base is available in the following sizes: US Letter/A4 / A3+ / 8x8”/ 8x12”/ 12x16”/ 16x20”/ 24x30”. Also available are the JetMaster mini- 5x5” and 5x7.5” which can be printed from a regular A4 desktop printer.